Fair use provides breathing space in copyright law, making sure that control of the right to copy and distribute doesn’t become control of the right to create and innovate. New technologies and services depend on the creation of multiple copies as a matter of course. At the same time, copyright terms cover works many decades old and copyrighted software appears in more and more devices. Taken together, these developments mean the potential reach of copyright may extend ever further. Fair use makes sure that the rights of the public expand at the same time. Unfortunately, the courts did not always let fair use play that role in 2018. On the plus side, the long-running litigation over the online publication of building codes and other standards that governments have adopted as binding law offered a prime example of fair use’s importance. As part of its mission of creating a comprehensive, fully accessible database of the law, Public Resource.org posts those binding standards on its website. Six industry groups, known as standards development organizations, accused PRO of copyright and trademark infringement for posting those standards online. In effect, they claimed the right to decide who can copy, share, and speak the law. In 2017, a federal district court ruled in favor of the standards organizations, and ordered PRO not to post the standards. This is an important ruling for the common-sense rights of all people. As Judge Katsas, the demands of the industry groups for exclusive control of the law "cannot be right: access to the law cannot be conditioned on the consent of a private party." Based on today’s unanimous ruling, EFF is confident we can demonstrate that Public Resource's posting of these standards is protected fair use. The law belongs to all of us. We all have a right to read, understand and share it. Unfortunately, fair use defenses were rejected in two other long-running cases. In February, the Second Circuit ruled against part of the service offered by TVEyes, which creates a text-searchable database of broadcast content from thousands of television and radio stations in the United States and worldwide. The service is used by exactly who you’d think would need a service like this: journalists, scholars, politicians, and so on, in order to monitor what’s being said in the media. If you’ve ever read a story where a public figure’s words now are contrasted with contradictory things they said in the past, that story likely relied on TVEyes. In 2014, the district court held that a lot of what TVEyes does is fair use, but asked to hear more about customers’ ability to archive video clips, share links to video clips via email, download clips, and search for clips by date and time (as opposed to keywords). In 2015, the district court found the archiving feature to be a fair use, but found the other features to be “infringing.” On appeal, the Second Circuit reversed [PDF] the 2015 finding that the archiving was fair use and upheld the finding that the rest of the TVEyes’ video features are not fair use. That’s a hugely disappointing result that could result in a decrease in news analysis and commentary. The following month, the Federal Circuit did its part to thwart innovation by holding that Google’s use, in its Android mobile operating system, of Java API labels infringed Oracle’s copyright. Rejecting the jury verdict, the district court’s holding, and established law, the appellate court held that Google’s use was not a fair use. This case should never have reached that stage. The works at the heart of the case are Java API labels that, as Google (and EFF) argued, should not even be eligible for copyright protection. Judge Alsup, who demonstrated some proficiency with programming Java in the first leg of the case, came to the same conclusion. But then it went to the Federal Circuit on appeal. The Federal Circuit, which usually focuses on patent issues, had jurisdiction because Oracle’s lawsuit originally contained a patent claim. Because the case was litigated in the Northern District of California, however, the Federal Circuit was supposed to apply Ninth Circuit law. Instead, it misread that law, reversed Judge Alsup’s ruling, and sent everyone back to San Francisco to litigate the question of whether Google’s use was a fair use. Here, again, the Ninth Circuit generally protects innovation by recognizing that copying of a functional work, like an API, is often necessary and appropriate in order to make something new. Consistent with that longstanding principle, when the jury was asked to evaluate the facts and apply the applicable legal standard, it found that Google’s use was fair. Having gone to the trouble of sending this case to a jury, you might think the Federal Circuit would respect the jury’s decision. It did not. In the court’s view, the jury’s finding was simply advisory and incorrect as a matter of law. The court overruled it and found that Google’s use of a highly functional work was not fair. The Federal Circuit has upended decades of software industry practice and created legal uncertainty that will chill innovation. Google is now looking to the Supreme Court to help clean up this mess. Let’s hope the Court takes the case. As we move past 2018, we’ll work to make sure the common-sense idea that access to laws can’t require permission is protected. 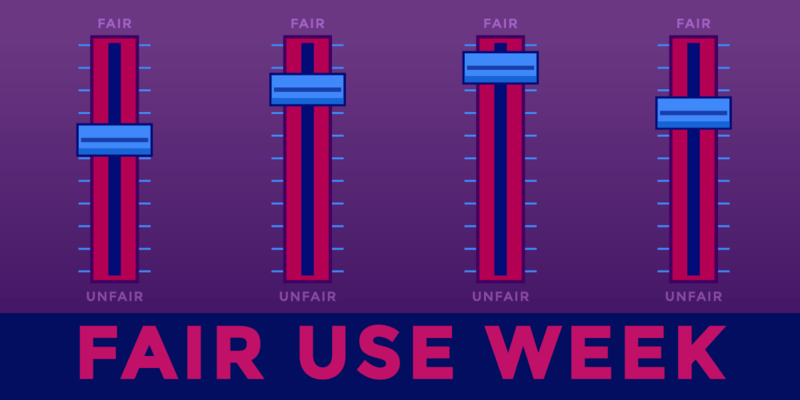 We’ll also continue to fight for fair use for tools that help with analysis and commentary.